Lose 14 pounds in 14 days-harness the power of food to reset your metabolism for good with this breakthrough program complete with recipes and a detailed, easy-to-use diet plan from the #1 New York Times bestselling author of The Fast Metabolism Diet. The diet industry has been plagued with crazy fad diets that do nothing but slow your metabolism and prime your body for yo-yo weight gain. It's time for a change. If you want to lose weight fast, do it in a healthful way, and have the tools and resources to keep it off for life, this is the book for you. Bestselling author, leading health and wellness entrepreneur, celebrity nutritionist, and motivational speaker Haylie Pomroy has the answers. 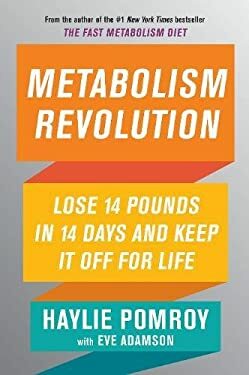 Drawing on her fundamental "food as medicine" techniques, she's created the Metabolism Revolution diet, which strategically manipulates macronutrients to speed the body's metabolic rate, a guaranteed way to kick start a stalled metabolism. Following the Metabolism Revolution plan, you will burn fat, build muscle, improve your skin, boost energy levels, and look and feel great-all while losing weight quickly and keeping it off for life. Backed by the latest science, Haylie's new program, her easiest to follow and most powerful one yet, allows you to determine your body's "metabolic intervention score" and create a customized plan to achieve healthy, rapid weight loss. Complete with meal maps, shopping lists, and more than sixty fabulous recipes, Metabolism Revolution is the proven way to quickly and deliciously drop the weight and leave you slimmer, healthier, and more energetic than ever. New (287 available) BRAND NEW. Over 1.5 million happy customers. 100% money-back guarantee. Make your purchase count: support Better World Books' worldwide literacy partners.